Recently I’ve been reading the journals of Robert Genjin Savage, a dear friend of the Zendo who died of AIDS in 1993, and I ran across this entry from 1986 when he was just getting into Zen: –œEven if sitting achieves nothing –˜spiritual’–”the mere taking stock of oneself every morning, putting aside so-called immediate concerns and seeing exactly what’s left–”that by itself justifies wasting 40 minutes a day.– I like that description: putting aside immediate concerns and seeing exactly what’s left. What would it be like right now to put aside all the demands of life: the fantasies, the duties, the machinations of the mind, the recriminations, the conditioning–”put all that aside for just a moment, or maybe for 20 minutes if not 40, and be present to what’s left. What happens when we do that? We reenter the depth of our life: the reality of our breath, the meaning of our life itself without all the rules and ideas that we have put on top of it–”the actual experience of our life. You know, before I began to practice Zen when I read this koan I thought it was a really cheap trick! But it isn’t. It is the teaching–” Genjin’s teaching–”of what’s left. Facing the wall–” in Japan it’s called –œBodhidharma’s Zen––”is a very simple practice. You don’t need to complicate it at all; you simply face the wall. 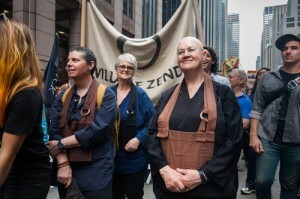 And that’s what we do here at the Village Zendo; that’s what all of the rigmarole is about. We’re creating a container that will allow us to sit and face the wall. And, of course, no one comes every day to the Zendo, but our practice provides a structure for you to then take home and do –”even if it’s not 40 minutes, even if it’s 20 minutes–”you take that time to be present to your life. It’s so important! Bodhidharma devoted his life to it.